Eucalyptus /ˌjuːkəˈlɪptəs/ is a genus of over seven hundred species of flowering trees, shrubs or mallees in the myrtle family, Myrtaceae commonly known as eucalypts. Plants in the genus Eucalyptus have bark that is smooth, fibrous or stringy, leaves with oil glands, and sepals and petals that are fused to form a "cap" or operculum over the stamens. The fruit is a woody capsule commonly referred to as a "gumnut". Australia is covered by 92,000,000 hectares (227,336,951 acres) of eucalypt forest, comprising three quarters of the area covered by native forest. There are more than 800 species of eucalyptus and most are native to Australia; a very small number are found in adjacent areas of New Guinea and Indonesia. One species, Eucalyptus deglupta, ranges as far north as the Philippines. Of the 15 species found outside Australia, just nine are exclusively non-Australian. Species of eucalyptus are cultivated widely in the tropical and temperate world, including the Americas, Europe, Africa, the Mediterranean Basin, the Middle East, China, and the Indian subcontinent. However, the range over which many eucalypts can be planted in the temperate zone is constrained by their limited cold tolerance. On warm days, eucalyptus forests are sometimes shrouded in a smog-like mist of vaporised volatile organic compounds (terpenoids); the Australian Blue Mountains take their name from the haze. Eucalypts vary in size and habit from shrubs to tall trees. Trees usually have a single main stem or trunk but many eucalypts are mallees that are multistemmed from ground level and rarely taller than 10 metres (33 ft). There is no clear distinction between a mallee and a shrub but in eucalypts, a shrub is a mature plant less than 1 metre (3 ft) tall and growing in an extreme environment. E. vernicosa in the Tasmanian highlands, E. yalatensis on the Nullarbor and E. surgens growing on coastal cliffs in Western Australia are examples of eucalypt shrubs. The terms "mallet" and "marlock" are only applied to Western Australian eucalypts. A mallet is a tree with a single thin trunk with a steeply branching habit but lacks both a lignotuber and epicormic buds. E. astringens is an example of a mallet. A marlock is a shrub or small tree with a single, short trunk, that lacks a lignotuber and has spreading, densely leafy branches that often reach almost to the ground. E. platypus is an example of a marlock. Eucalyptus trees, including mallees and marlocks, are single-stemmed and include Eucalyptus regnans, the tallest known flowering plant on Earth. The term "morrell" is somewhat obscure in origin and appears to apply to trees of the western Australian wheatbelt and goldfields which have a long, straight trunk, completely rough-barked. It is now used mainly for E. longicornis (red morrell) and E. melanoxylon (black morrell). All eucalypts add a layer of bark every year and the outermost layer dies. In about half of the species, the dead bark is shed exposing a new layer of fresh, living bark. The dead bark may be shed in large slabs, in ribbons or in small flakes. These species are known as "smooth barks" and include E. sheathiana, E. diversicolor, E. cosmophylla and E. cladocalyx. The remaining species retain the dead bark which dries out and accumulates. In some of these species, the fibres in the bark are loosely intertwined (in stringybarks such as E. macrorhyncha or peppermints such as E. radiata) or more tightly adherent (as in the "boxes" such as E. leptophleba). In some species (the "ironbarks" such as E. crebra and E. jensenii) the rough bark is infused with gum resin. Many species are ‘half-barks’ or ‘blackbutts’ in which the dead bark is retained in the lower half of the trunks or stems — for example, E. brachycalyx, E. ochrophloia, and E. occidentalis — or only in a thick, black accumulation at the base, as in E. clelandii. In some species in this category, for example E. youngiana and E. viminalis, the rough basal bark is very ribbony at the top, where it gives way to the smooth upper stems. The smooth upper bark of the half-barks and that of the completely smooth-barked trees and mallees can produce remarkable colour and interest, for example E. deglupta. E. globulus bark cells are able to photosynthesize in the absence of foliage, conferring an "increased capacity to re-fix internal CO2 following partial defoliation". This allows the tree to grow in less-than-ideal climates, in addition to providing a better chance of recovery from damage sustained to its leaves in an event such as a fire. Nearly all eucalyptus are evergreen, but some tropical species lose their leaves at the end of the dry season. As in other members of the myrtle family, eucalyptus leaves are covered with oil glands. The copious oils produced are an important feature of the genus. Although mature eucalyptus trees may be towering and fully leafed, their shade is characteristically patchy because the leaves usually hang downwards. The leaves on a mature eucalyptus plant are commonly lanceolate, petiolate, apparently alternate and waxy or glossy green. In contrast, the leaves of seedlings are often opposite, sessile and glaucous, but many exceptions to this pattern exist. Many species such as E. melanophloia and E. setosa retain the juvenile leaf form even when the plant is reproductively mature. Some species, such as E. macrocarpa, E. rhodantha, and E. crucis, are sought-after ornamentals due to this lifelong juvenile leaf form. A few species, such as E. petraea, E. dundasii, and E. lansdowneana, have shiny green leaves throughout their life cycle. E. caesia exhibits the opposite pattern of leaf development to most eucalyptus, with shiny green leaves in the seedling stage and dull, glaucous leaves in mature crowns. The contrast between juvenile and adult leaf phases is valuable in field identification. Four leaf phases are recognised in the development of a eucalyptus plant: the ‘seedling’, ‘juvenile’, ‘intermediate’, and ‘adult’ phases. However, no definite transitional point occurs between the phases. The intermediate phase, when the largest leaves are often formed, links the juvenile and adult phases. In all except a few species, the leaves form in pairs on opposite sides of a square stem, consecutive pairs being at right angles to each other (decussate). In some narrow-leaved species, for example E. oleosa, the seedling leaves after the second leaf pair are often clustered in a detectable spiral arrangement about a five-sided stem. After the spiral phase, which may last from several to many nodes, the arrangement reverts to decussate by the absorption of some of the leaf-bearing faces of the stem. In those species with opposite adult foliage the leaf pairs, which have been formed opposite at the stem apex, become separated at their bases by unequal elongation of the stem to produce the apparently alternate adult leaves. The most readily recognisable characteristics of eucalyptus species are the distinctive flowers and fruit (capsules or "gumnuts"). Flowers have numerous fluffy stamens which may be white, cream, yellow, pink, or red; in bud, the stamens are enclosed in a cap known as an operculum which is composed of the fused sepals or petals, or both. Thus, flowers have no petals, but instead decorate themselves with the many showy stamens. As the stamens expand, the operculum is forced off, splitting away from the cup-like base of the flower; this is one of the features that unites the genus. The woody fruits or capsules are roughly cone-shaped and have valves at the end which open to release the seeds, which are waxy, rod-shaped, about 1 mm in length, and yellow-brown in colour. Most species do not flower until adult foliage starts to appear; E. cinerea and E. perriniana are notable exceptions. The genus Eucalyptus was first formally described in 1789 by Charles Louis L'Héritier de Brutelle who published the description in his book Sertum Anglicum, seu, Plantae rariores quae in hortis juxta Londinum along with a description of the type species, Eucalyptus obliqua. The name Eucalyptus is derived from the Ancient Greek words eu meaning "good", "well", "true", "beautiful" or "very":373 and kalypto meaning "cover", "conceal" or "hide":234 referring to the operculum covering the flower buds. The type specimen was collected in 1777 by David Nelson, the gardener-botanist on Cook's third voyage. He collected the specimen on Bruny Island and sent it to de Brutelle who was working in London at that time. The oldest definitive Eucalyptus fossils are surprisingly from South America, where eucalypts are no longer endemic, though have been introduced from Australia. The fossils are from the early Eocene (51.9 Mya), and were found in the Laguna del Hunco deposit in Chubut province in Argentina. This shows that the genus had a Gondwanan distribution. Fossil leaves also occur in the Miocene of New Zealand, where the genus is not native today, but again have been introduced from Australia. Despite the prominence of Eucalyptus in modern Australia, estimated to contribute some 75% of the modern vegetation, the fossil record is very scarce throughout much of the Cenozoic, and suggests that this rise to dominance is a geologically more recent phenomenon. The oldest reliably dated macrofossil of Eucalyptus is a 21-million-year-old tree-stump encased in basalt in the upper Lachlan Valley in New South Wales. Other fossils have been found, but many are either unreliably dated or else unreliably identified. It is useful to consider where Eucalyptus fossils have not been found. Extensive research has gone into the fossil floras of the Paleocene to Oligocene of South-Eastern Australia, and has failed to uncover a single Eucalyptus specimen. Although the evidence is sparse, the best hypothesis is that in the mid-Tertiary, the contintental margins of Australia only supported more mesic noneucalypt vegetation, and that eucalypts probably contributed to the drier vegetation of the arid continental interior. With the progressive drying out of the continent since the Miocene, eucalypts were displaced to the continental margins, and much of the mesic and rainforest vegetation that was once there was eliminated entirely. The current superdominance of Eucalyptus in Australia may be an artefact of human influence on its ecology. In more recent sediments, numerous findings of a dramatic increase in the abundance of Eucalyptus pollen are associated with increased charcoal levels. Though this occurs at different rates throughout Australia, it is compelling evidence for a relationship between the artificial increase of fire frequency with the arrival of Aboriginals and increased prevalence of this exceptionally fire-tolerant genus. Over 700 species of Eucalyptus are known; refer to the List of Eucalyptus species for a comprehensive list of species. Some have diverged from the mainstream of the genus to the extent that they are quite isolated genetically and are able to be recognised by only a few relatively invariant characteristics. Most, however, may be regarded as belonging to large or small groups of related species, which are often in geographical contact with each other and between which gene exchange still occurs. In these situations, many species appear to grade into one another, and intermediate forms are common. In other words, some species are relatively fixed genetically, as expressed in their morphology, while others have not diverged completely from their nearest relatives. Hybrid individuals have not always been recognised as such on first collection and some have been named as new species, such as E. chrysantha (E. preissiana × E. sepulcralis) and E. "rivalis" (E. marginata × E. megacarpa). Hybrid combinations are not particularly common in the field, but some other published species frequently seen in Australia have been suggested to be hybrid combinations. For example, E. erythrandra is believed to be E. angulosa × E. teraptera and due to its wide distribution is often referred to in texts. Renantherin, a phenolic compound present in the leaves of some eucalyptus species, allows chemotaxonomic discrimination in the sections renantheroideae and renantherae and the ratio of the amount of leucoanthocyanins varies considerably in certain species. Eucalyptus is one of three similar genera that are commonly referred to as "eucalypts", the others being Corymbia and Angophora. Many species, though by no means all, are known as gum trees because they exude copious kino from any break in the bark (e.g., scribbly gum). The generic name is derived from the Greek words ευ (eu) "well" and καλύπτω (kalýpto) "to cover", referring to the operculum on the calyx that initially conceals the flower. Several eucalypt species are among the tallest trees in the world. Eucalyptus regnans, the Australian 'mountain ash', is the tallest of all flowering plants (angiosperms); today, the tallest measured specimen named Centurion is 100.5 m (330 ft) tall. Coast Douglas-fir is about the same height; only coast redwood is taller, and they are conifers (gymnosperms). Six other eucalypt species exceed 80 metres in height: Eucalyptus obliqua, Eucalyptus delegatensis, Eucalyptus diversicolor, Eucalyptus nitens, Eucalyptus globulus and Eucalyptus viminalis. Most eucalypts are not tolerant of severe cold. Eucalypts do well in a range of climates but are usually damaged by anything beyond a light frost of −5 °C (23 °F); the hardiest are the snow gums, such as Eucalyptus pauciflora, which is capable of withstanding cold and frost down to about −20 °C (−4 °F). Two subspecies, E. pauciflora subsp. niphophila and E. pauciflora subsp. debeuzevillei in particular are even hardier and can tolerate even quite severe winters. Several other species, especially from the high plateau and mountains of central Tasmania such as Eucalyptus coccifera, Eucalyptus subcrenulata and Eucalyptus gunnii, have also produced extreme cold-hardy forms and it is seed procured from these genetically hardy strains that are planted for ornament in colder parts of the world. An essential oil extracted from eucalyptus leaves contains compounds that are powerful natural disinfectants and can be toxic in large quantities. Several marsupial herbivores, notably koalas and some possums, are relatively tolerant of it. The close correlation of these oils with other more potent toxins called formylated phloroglucinol compounds (euglobals, macrocarpals and sideroxylonals) allows koalas and other marsupial species to make food choices based on the smell of the leaves. For koalas, these compounds are the most important factor in leaf choice. Eucalyptus flowers produce a great abundance of nectar, providing food for many pollinators including insects, birds, bats and possums. Although eucalyptus trees are seemingly well-defended from herbivores by the oils and phenolic compounds, they have insect pests. These include the eucalyptus longhorn borer Phoracantha semipunctata and the aphid-like psyllids known as "bell lerps", both of which have become established as pests throughout the world wherever eucalypts are cultivated. The eusocial beetle Austroplatypus incompertus makes and defends its galleries exclusively inside Eucalyptus plants. The trunks and branches of the eucalyptus tree allow the largest known moth, Zelotypia stacyi (the bentwing ghost moth, having a wingspan up to 250 mm) to feed and protect their larva and pupa, respectively. Eucalypts originated between 35 and 50 million years ago, not long after Australia-New Guinea separated from Gondwana, their rise coinciding with an increase in fossil charcoal deposits (suggesting that fire was a factor even then), but they remained a minor component of the Tertiary rainforest until about 20 million years ago, when the gradual drying of the continent and depletion of soil nutrients led to the development of a more open forest type, predominantly Casuarina and Acacia species. The two valuable timber trees, alpine ash E. delegatensis and Australian mountain ash E. regnans, are killed by fire and only regenerate from seed. The same 2003 bushfire that had little impact on forests around Canberra resulted in thousands of hectares of dead ash forests. However, a small amount of ash survived and put out new ash trees as well. There has been some debate as to whether to leave the stands or attempt to harvest the mostly undamaged timber, which is increasingly recognised as a damaging practice. Eucalyptus oil is highly flammable; ignited trees have been known to explode. Bushfires can travel easily through the oil-rich air of the tree crowns. Eucalypts obtain long-term fire survivability from their ability to regenerate from epicormic buds situated deep within their thick bark, or from lignotubers, or by producing serotinous fruits. In seasonally dry climates oaks are often fire-resistant, particularly in open grasslands, as a grass fire is insufficient to ignite the scattered trees. In contrast, a eucalyptus forest tends to promote fire because of the volatile and highly combustible oils produced by the leaves, as well as the production of large amounts of litter high in phenolics, preventing its breakdown by fungi and thus accumulating as large amounts of dry, combustible fuel. Consequently, dense eucalypt plantings may be subject to catastrophic firestorms. In fact, almost thirty years before the Oakland firestorm of 1991, a study of eucalyptus in the area warned that the litter beneath the trees builds up very rapidly and should be regularly monitored and removed. It has been estimated that 70% of the energy released through the combustion of vegetation in the Oakland fire was due to eucalyptus. In a National Park Service study, it was found that the fuel load (in tons per acre) of non-native eucalyptus woods is almost three times as great as native oak woodland. Some species of gum trees drop branches unexpectedly. In Australia, Parks Victoria warns campers not to camp under river red gums. Some councils in Australia such as Gosnells, Western Australia, have removed eucalypts after reports of damage from dropped branches, even in the face of lengthy, well publicised protests to protect particular trees. A former Australian National Botanic Gardens director and consulting arborist, Robert Boden, has been quoted referring to "summer branch drop". Dropping of branches is recognised in Australia literature through the fictional death of Judy in Seven Little Australians. Although all large trees can drop branches, the density of eucalyptus wood is high due to its high resin content, increasing the hazard. Eucalypts were introduced from Australia to the rest of the world following the Cook expedition in 1770. Collected by Sir Joseph Banks, botanist on the expedition, they were subsequently introduced to many parts of the world, notably California, southern Europe, Africa, the Middle East, South Asia and South America. On the order of 250 species are under cultivation in California. In Portugal and also Spain, eucalypts have been planted in plantations for the production of pulpwood. 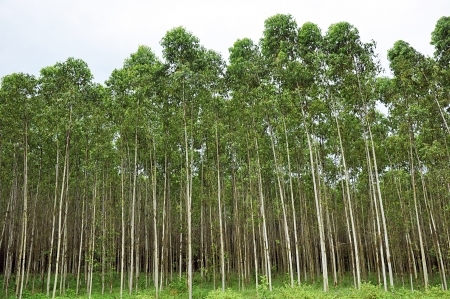 Eucalyptus are the basis for several industries, such as sawmilling, pulp, charcoal and others. Several species have become invasive and are causing major problems for local ecosystems, mainly due to the absence of wildlife corridors and rotations management. Eucalypts have many uses which have made them economically important trees, and have become a cash crop in poor areas such as Timbuktu, Mali:22and the Peruvian Andes, despite concerns that the trees are invasive in some countries like South Africa. Best-known are perhaps the varieties karri and yellow box. Due to their fast growth, the foremost benefit of these trees is their wood. They can be chopped off at the root and grow back again. They provide many desirable characteristics for use as ornament, timber, firewood and pulpwood. It is also used in a number of industries, from fence posts and charcoal to cellulose extraction for biofuels. Fast growth also makes eucalypts suitable as windbreaks and to reduce erosion. Some eucalyptus species have attracted attention from horticulturists, global development researchers, and environmentalists because of desirable traits such as being fast-growing sources of wood, producing oil that can be used for cleaning and as a natural insecticide, or an ability to be used to drain swamps and thereby reduce the risk of malaria. Eucalyptus oil finds many uses like in fuels, fragrances, insect repellance and antimicrobial activity. Eucalyptus trees show allelopathic effects; they release compounds which inhibit other plant species from growing nearby. Outside their natural ranges, eucalypts are both lauded for their beneficial economic impact on poor populations:22 and criticised for being "water-guzzling" aliens, leading to controversy over their total impact. Eucalypts draw a tremendous amount of water from the soil through the process of transpiration. They have been planted (or re-planted) in some places to lower the water table and reduce soil salination. Eucalypts have also been used as a way of reducing malaria by draining the soil in Algeria, Lebanon, Sicily, elsewhere in Europe, in Caucasus (Western Georgia), and California. Drainage removes swamps which provide a habitat for mosquito larvae, but can also destroy ecologically productive areas. This drainage is not limited to the soil surface, because the eucalyptus roots are up to 2.5 m (8.2 ft) in length and can, depending on the location, even reach the phreatic zone. Eucalyptus is the most common short fibre source for pulpwood to make pulp. The types most often used in papermaking are Eucalyptus globulus (in temperate areas) and the Eucalyptus urophylla x Eucalyptus grandis hybrid (in the tropics). The fibre length of Eucalyptus is relatively short and uniform with low coarseness compared with other hardwoods commonly used as pulpwood. The fibres are slender, yet relatively thick walled. This gives uniform paper formation and high opacity that are important for all types of fine papers. The low coarseness is important for high quality coated papers. Eucalyptus is suitable for many tissue papers as the short and slender fibres gives a high number of fibres per gram and low coarseness contributes to softness. Eucalyptus oil is readily steam distilled from the leaves and can be used for cleaning and as an industrial solvent, as an antiseptic, for deodorising, and in very small quantities in food supplements, especially sweets, cough drops, toothpaste and decongestants. It has insect repellent properties, and is an active ingredient in some commercial mosquito repellents. Eucalyptus globulus is the principal source of eucalyptus oil worldwide. The nectar of some eucalypts produces high-quality monofloral honey. Eucalypt wood is also commonly used to make didgeridoos, a traditional Australian Aboriginal wind instrument. The trunk of the tree is hollowed out by termites, and then cut down if the bore is of the correct size and shape. All parts of Eucalyptus may be used to make dyes that are substantive on protein fibres (such as silk and wool), simply by processing the plant part with water. Colours to be achieved range from yellow and orange through green, tan, chocolate and deep rust red. The material remaining after processing can be safely used as mulch or fertiliser. Eucalyptus trees in the Australian outback draw up gold from tens of metres underground through their root system and deposit it as particles in their leaves and branches. A Maia detector for x-ray elemental imaging at the Australian Synchrotron clearly showed deposits of gold and other metals in the structure of eucalyptus leaves from the Kalgoorlie region of Western Australia that would have been untraceable using other methods. The microscopic leaf-bound "nuggets", about 8 micrometres wide on average, are not worth collecting themselves, but may provide an environmentally benign way of locating subsurface mineral deposits. In the 20th century, scientists around the world experimented with eucalyptus species. They hoped to grow them in the tropics, but most experimental results failed until breakthroughs in the 1960s-1980s in species selection, silviculture, and breeding programs "unlocked" the potential of eucalypts in the tropics. Prior to then, as Brett Bennett noted in a 2010 article, eucalypts were something of the "El Dorado" of forestry. Today, eucalyptus is the most widely planted type of tree in plantations around the world, in South America (mainly in Brazil, Argentina, Paraguay and Uruguay), South Africa, Australia, India, Galicia, Portugal and many more. In the 1850s, Eucalyptus trees were introduced to California by Australians during the California Gold Rush. Much of California has a similar climate to parts of Australia. By the early 1900s, thousands of acres of eucalypts were planted with the encouragement of the state government. It was hoped that they would provide a renewable source of timber for construction, furniture making and railroad ties. It was soon found that for the latter purpose eucalyptus was particularly unsuitable, as the ties made from eucalyptus had a tendency to twist while drying, and the dried ties were so tough that it was nearly impossible to hammer rail spikes into them. They went on to note that the promise of eucalyptus in California was based on the old virgin forests of Australia. This was a mistake, as the young trees being harvested in California could not compare in quality to the centuries-old eucalyptus timber of Australia. It reacted differently to harvest. The older trees didn't split or warp as the infant California crop did. There was a vast difference between the two, and this would doom the California eucalyptus industry. One way in which the eucalyptus, mainly the blue gum E. globulus, proved valuable in California was in providing windbreaks for highways, orange groves, and farms in the mostly treeless central part of the state. They are also admired as shade and ornamental trees in many cities and gardens. Eucalyptus plantations in California have been criticised, because they compete with native plants and do not support native animals. Fire is also a problem. The 1991 Oakland Hills firestorm, which destroyed almost 3,000 homes and killed 25 people, was partly fuelled by large numbers of eucalypts close to the houses. In some parts of California, eucalypt plantations are being removed and native trees and plants restored. Individuals have also illegally destroyed some trees and are suspected of introducing insect pests from Australia which attack the trees. Certain eucalyptus species may also be grown for ornament in warmer parts of the Pacific Northwest — western Washington, western Oregon and southwestern British Columbia. Antonio Lussich introduced Eucalyptus into Uruguay in approximately 1896, throughout what is now Maldonado Department, and it has spread all over the south-eastern and eastern coast. There had been no trees in the area because it consisted of dry sand dunes and stones. Lussich also introduced many other trees, particularly Acacia and pines, but they have not expanded so extensively. Uruguayan forestry crops using eucalyptus species have been promoted since 1989, when the new National Forestry Law established that 20% of the national territory would be dedicated to forestry. As the main landscape of Uruguay is grassland (140,000 km2, 87% of the national territory), most of the forestry plantations would be established in prairie regions. The planting of Eucalyptus sp. has been criticised because of concerns that soil would be degraded by nutrient depletion and other biological changes. During the last ten years, in the northwestern regions of Uruguay the Eucalyptus sp. plantations have reached annual forestation rates of 300%. That zone has a potential forested area of 1 million hectares, approximately 29% of the national territory dedicated to forestry, of which approximately 800,000 hectares are currently forested by monoculture of Eucalyptus spp. It is expected that the radical and durable substitution of vegetation cover leads to changes in the quantity and quality of soil organic matter. Such changes may also influence soil fertility and soil physical and chemical properties. The soil quality effects associated with Eucalyptus sp. plantations could have adverse effects on soil chemistry; for example: soil acidification, iron leaching, allelopathic activities and a high C:N ratio of litter. Additionally, as most scientific understanding of land cover change effects is related to ecosystems where forests were replaced by grasslands or crops, or grassland was replaced by crops, the environmental effects of the current Uruguayan land cover changes are not well understood. The first scientific publication on soil studies in western zone tree plantations (focused on pulp production) appeared in 2004 and described soil acidification and soil carbon changes, similar to a podzolisation process, and destruction of clay (illite-like minerals), which is the main reservoir of potassium in the soil. Although these studies were carried out in an important zone for forest cultivation, they cannot define the current situation in the rest of the land area under eucalyptus cultivation. Moreover, recently Jackson and Jobbagy have proposed another adverse environmental impact that may result from Eucalyptus culture on prairie soils — stream acidification. The eucalyptus species most planted are E. grandis, E. globulus and E. dunnii; they are used mainly for pulp mills. Approximately 80,000 ha of E. grandis situated in the departments of Rivera, Tacuarembó and Paysandú is primarily earmarked for the solid wood market, although a portion of it is used for sawlogs and plywood. The current area under commercial forest plantation is 6% of the total. The main uses of the wood produced are elemental chlorine free pulp mill production (for cellulose and paper), sawlogs, plywood and bioenergy (thermoelectric generation). Most of the products obtained from sawmills and pulp mills, as well as plywood and logs, are exported. This has raised the income of this sector with respect to traditional products from other sectors. Uruguayan forestry plantations have rates of growth of 30 cubic metres per hectare per year and commercial harvesting occurs after nine years. Eucalypts were introduced to Brazil in 1910, for timber substitution and the charcoal industry. It has thrived in the local environment, and today there are around 7 million hectares planted. The wood is highly valued by the charcoal and pulp and paper industries. The short rotation allows a larger wood production and supplies wood for several other activities, helping to preserve the native forests from logging. When well managed, the plantation soils can sustain endless replanting. Eucalyptus plantings are also used as wind breaks. Brazil's plantations have world-record rates of growth, typically over 40 cubic metres per hectare per year, and commercial harvesting occurs after years 5. Due to continual development and governmental funding, year-on-year growth is consistently being improved. Eucalyptus can produce up to 100 cubic metres per hectare per year. Brazil has become the top exporter and producer of Eucalyptus round wood and pulp, and has played an important role in developing the Australian market through the country's[clarification needed] committed research in this area. The local iron producers in Brazil rely heavily on sustainably grown Eucalyptus for charcoal; this has greatly pushed up the price of charcoal in recent years. The plantations are generally owned and operated for national and international industry by timber asset companies such as Thomson Forestry, Greenwood Management or cellulose producers such as Aracruz Cellulose and Stora Enso. Overall, South America was expected to produce 55% of the world's Eucalyptus round-wood by 2010. Many environmental NGOs have criticised the use of exotic tree species for forestry in Latin America. Ethiopia. Eucalypts were introduced to Ethiopia in either 1894 or 1895, either by Emperor Menelik II's French advisor Mondon-Vidailhet or by the Englishman Captain O'Brian. Menelik II endorsed its planting around his new capital city of Addis Ababa because of the massive deforestation around the city for firewood. According to Richard R.K. Pankhurst, "The great advantage of the eucalypts was that they were fast growing, required little attention and when cut down grew up again from the roots; it could be harvested every ten years. The tree proved successful from the onset". Plantations of eucalypts spread from the capital to other growing urban centres such as Debre Marqos. Pankhurst reports that the most common species found in Addis Ababa in the mid-1960s was E. globulus, although he also found E. melliodora and E. rostrata in significant numbers. David Buxton, writing of central Ethiopia in the mid-1940s, observed that eucalyptus trees "have become an integral -- and a pleasing -- element in the Shoan landscape and has largely displaced the slow-growing native 'cedar' Juniperus procera)." It was commonly believed that the thirst of the Eucalyptus "tended to dry up rivers and wells", creating such opposition to the species that in 1913 a proclamation was issued ordering a partial destruction of all standing trees, and their replacement with mulberry trees. Pankhurst reports, "The proclamation however remained a dead letter; there is no evidence of eucalypts being uprooted, still less of mulberry trees being planted." Eucalypts remain a defining feature of Addis Ababa. Madagascar. Much of Madagascar's original native forest has been replaced with Eucalyptus, threatening biodiversity by isolating remaining natural areas such as Andasibe-Mantadia National Park. South Africa. Numerous Eucalyptus species have been introduced into South Africa, mainly for timber and firewood but also for ornamental purposes. They are popular with beekeepers for the honey they provide. However, in South Africa they are considered invasive, with their water-sucking capabilities threatening water supplies. They also release a chemical into the surrounding soil which kills native competitors. Eucalyptus seedlings are usually unable to compete with the indigenous grasses, but after a fire when the grass cover has been removed, a seed-bed may be created. The following Eucalyptus species have been able to become naturalised in South Africa: E. camaldulensis, E. cladocalyx, E. diversicolor, E. grandis and E. lehmannii. Zimbabwe. As in South Africa, many Eucalyptus species have been introduced into Zimbabwe, mainly for timber and firewood, and E. robusta and E. tereticornis have been recorded as having become naturalised there. In continental Portugal, the Azores and continental Spain (especially in Cantabria, Biscay, Asturias and Galicia in the north, and Huelva in Andalusia) farmland has been replaced with eucalypt plantations since their introduction by Rosendo Salvado in the 19th century. In Italy, the eucalyptus only arrived at the turn of the 19th century and large scale plantations were started at the beginning of the 20th century with the aim of drying up swampy ground to defeat malaria. During the 1930s, Benito Mussolini had thousands of eucalyptus plants planted in the marshes around Rome. This, their rapid growth in the Italian climate and excellent function as windbreaks, has made them a common sight in the south of the country, including the islands of Sardinia and Sicily. They are also valued for the characteristic smelling and tasting honey that is produced from them. The variety of eucalyptus most commonly found in Italy is E. camaldulensis. In Greece, eucalypts are widely found, especially in southern Greece and Crete. They are cultivated and used for various purposes, including as an ingredient in pharmaceutical products (e.g., creams, elixirs and sprays) and for leather production. They were imported in 1862 by botanist Theodoros Georgios Orphanides. The principal species is Eucalyptus globulus. Eucalyptus has been grown in Ireland since trials in the 1930s and now grows wild in South Western Ireland in the mild climate. Eucalyptus seeds of the species E. globulus were imported into Palestine in the 1860s, but did not acclimatise well. Later, E. camaldulensis was introduced more successfully and it is still a very common tree in Israel. The use of eucalyptus trees to drain swampy land was a common practice in the late nineteenth and early twentieth centuries. The German Templer colony of Sarona had begun planting eucalyptus for this purpose by 1874, though it is not known where the seeds came from. Many Zionist colonies also adopted the practice in the following years under the guidance of the Mikveh Israel Agricultural School. In India, the Institute of Forest Genetics and Tree Breeding, Coimbatore started a eucalyptus breeding program in the 1990s. The organisation released four varieties of conventionally bred, high yielding and genetically improved clones for commercial and research interests in 2010. Eucalyptus trees were introduced to Sri Lanka in the late 19th century by tea and coffee planters, for wind protection, shade and fuel. Forestry replanting of eucalyptus began in the 1930s in deforested mountain areas, and currently there are about 10 species present in the island. They account for 20% of major reforestation plantings. They provide railway sleepers, utility poles, sawn timber and fuelwood, but are controversial because of their adverse effect on biodiversity, hydrology and soil fertility. They are associated with another invasive species, the eucalyptus gall wasp, Leptocybe invasa. Hawaii Some 90 species of eucalyptus have been introduced to the islands, where they have displaced some native species due to their higher maximum height, fast growth and lower water needs. Particularly noticeable is the rainbow eucalyptus (Eucalyptus deglupta), native to Indonesia and the Philippines, whose bark falls off to reveal a trunk that can be green, red, orange, yellow, pink and purple. Due to similar favourable climatic conditions, Eucalyptus plantations have often replaced oak woodlands, for example in California, Spain and Portugal. The resulting monocultures have raised concerns about loss of biological diversity, through loss of acorns that mammals and birds feed on, absence of hollows that in oak trees provide shelter and nesting sites for birds and small mammals and for bee colonies, as well as lack of downed trees in managed plantations. A study of the relationship between birds and eucalyptus in the San Francisco Bay Area found that bird diversity was similar in native forest vs. eucalyptus forest but the species were different. One way in which the avifauna changes is that cavity nesting birds including woodpeckers, owls, chickadees, wood ducks, etc. are depauperate in eucalyptus groves because the decay-resistant wood of these trees prevents cavity formation by decay or excavation. Also those bird species that glean insects from foliage, such as warblers and vireos, have population declines when eucalyptus replace oak forest. Birds that do well in eucalyptus groves in California like tall vertical habitat like herons and egrets (possibly because redwood trees are less available), or have longer bills, which may play a role in preventing their nostrils from being clogged by eucalyptus resin/pitch. The Point Reyes Bird Observatory observes that sometimes short-billed birds like the ruby-crowned kinglet are found dead beneath eucalyptus trees with their nostrils clogged with pitch. Monarch butterflies use eucalyptus in California for over-wintering, but in some locations have a preference for Monterey pines. Although eucalypts must have been seen by the very early European explorers and collectors, no botanical collections of them are known to have been made until 1770 when Joseph Banks and Daniel Solander arrived at Botany Bay with Captain James Cook. There they collected specimens of E. gummifera and later, near the Endeavour River in northern Queensland, E. platyphylla; neither of these species was named as such at the time. In 1777, on Cook's third expedition, David Nelson collected a eucalypt on Bruny Island in southern Tasmania. This specimen was taken to the British Museum in London, and was named Eucalyptus obliqua by the French botanist L'Héritier, who was working in London at the time. He coined the generic name from the Greek roots eu and calyptos, meaning "well" and "covered" in reference to the operculum of the flower bud which protects the developing flower parts as the flower develops and is shed by the pressure of the emerging stamens at flowering. It was most likely an accident that L'Héritier chose a feature common to all eucalypts. The name obliqua was derived from the Latin obliquus, meaning "oblique", which is the botanical term describing a leaf base where the two sides of the leaf blade are of unequal length and do not meet the petiole at the same place. E. obliqua was published in 1788-89, which coincided with the first official European settlement of Australia. Between then and the turn of the 19th century, several more species of Eucalyptus were named and published. Most of these were by the English botanist James Edward Smith and most were, as might be expected, trees of the Sydney region. These include the economically valuable E. pilularis, E. saligna and E. tereticornis. The first endemic Western Australian Eucalyptus to be collected and subsequently named was the Yate (E. cornuta) by the French botanist Jacques Labillardière, who collected in what is now the Esperance area in 1792. Several Australian botanists were active during the 19th century, particularly Ferdinand von Mueller, whose work on eucalypts contributed greatly to the first comprehensive account of the genus in George Bentham's Flora Australiensis in 1867. The account is the most important early systematic treatment of the genus. Bentham divided it into five series whose distinctions were based on characteristics of the stamens, particularly the anthers (Mueller, 1879–84), work elaborated by Joseph Henry Maiden (1903–33) and still further by William Faris Blakely (1934). The anther system became too complex to be workable and more recent systematic work has concentrated on the characteristics of buds, fruits, leaves and bark. Eucalyptus sideroxylon, showing fruit (capsules) and buds with operculum present. Eucalyptus forest in East Gippsland, Victoria. Mostly E. albens (white box). Eucalyptus forest in East Gippsland, Victoria. Mostly E.albens (white box). A Eucalyptus tree with the sun shining through its branches. Eucalyptus bridgesiana (apple box) on Red Hill, Australian Capital Territory. Eucalyptus gunnii planted in southern England. The lower part of the trunk is covered in ivy. Eucalyptus grandis. Province of Buenos Aires, Argentina. Eucalyptus rubida (candlebark gum) in Burra, New South Wales. Eucalypt woodland area near Prospect Creek in western Sydney. Mostly E. amplifolia and E. tereticornis.